A Tel Aviv city council member announced a campaign a few days ago encouraging opening businesses on the night of Tisha B'Av. Arutz Sheva discussed the legal aspect of the move with retired former Tel Aviv District Court Deputy Chief Justice and Ariel University lecturer Judge Prof. Oded Mudrik. 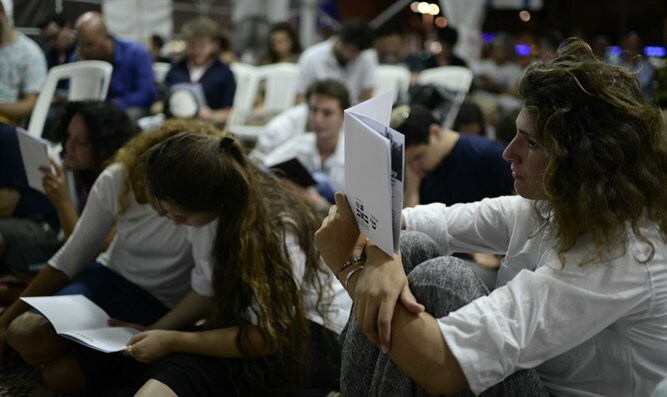 "There's a framework law authorizing local authorities to close houses of leisure and food on Tisha B'Av," says Prof. Mudrik, who notes that "ostensibly things are given to the discretion of each authority. If an authority so decides, this applies to all its residents. In other words, if Tel Aviv decides, it would also be relevant to Jaffa." However, Mudrik himself believes the importance of the Tisha B'Av fast is so deep that the decision to observe the fast publicly by the local authority can not be left to each and every locality. "If there's justification for this, it doesn't stem from fulfilling religious law and religious tradition, but from the fact that two thousand years ago we lost our sovereignty over the Land of Israel and were forced to go to exile and today we renewed sovereignty. To strengthen the awareness that today's new appliers of sovereignty are the children of those who lost sovereignty, we mark the double day of the destruction of the Temple as a symbol of the fact that we were here and returned to the place, and the chain hasn't been broken." He says such a public statement is important "against those who claim it can be a state of all its citizens, or that Judaism has no connection to any particular place. There's a far-reaching claim that the Jews of today aren't necessarily the offspring of those who lived here during the period of the destruction or the Mishnah, but rather a large mixed multitude of converts over the years, claims some are trying to prove with DNA tests. To present these claimants with the fact that we were here and will continue to be here, we must mark this day as we commemorate Independence Day and Memorial Day for IDF Fallen Soldiers. It's a memorial day that preserves our connection to the Jews who were here two thousand years ago, so I think this shouldn't be optional or a choice left to the authorities, but a duty." Mudrik highlighted the need to establish the fast as a national duty: "I hear restaurant owners say they have nothing to do with this mourning over what happened two thousand years ago. This is also true of those who don't think the State should be a state of all its citizens, but since they get no explanation of the importance of marking these days, they don't understand the meaning of what they see as a kind of religious coercion and religionization. If many speak of a state of all its citizens, the order should come from above, and it stems from the new Nationality Law that wants to say the State is the Jewish State." In the wake of these remarks, retired Justice Mudrik was asked how much his position emphasizes the fact that the State of Israel is the state of the Jewish People in the entire legal system and not only in his position and opinion and those agreeing with him. "This position exists and is present," he says. "There's constant tension between the Jewish character of the State and its democratic character. Of course there are points of friction and one must be wary of a situation in which one element imposes itself on the other and annuls it, not the democratic one and not the other." Prof. Mudrik's finds an example in the Law of Return that concerns immigration of Jews to their country and the possibility of separate, not mixed, Jewish communities. "The courts try to strike a balance between these aspects. As a judge, I will make every effort to preserve two aspects of the character of the State. The Law of Return is a red line that I won't cancel, and even if they say that to preserve the State as a Jewish State everything has to be conducted according to the halakha that this, too, is a red line. Although I believe halakha doesn't contradict democracy." Professor Mudrik surprisingly notes that it is not enough that this position exists and is present in the corridors of Israeli law, but that "this is also the position of Aharon Barak. This is the basis and this is the essence. Many times people don't understand the Supreme Court's ruling and the efforts it makes to uphold these two principles."